The president has reveled in the spotlight during natural disasters, courting controversy along the way. Natural disasters offer presidents the opportunity to seize the commander-in-chief role, both warning Americans to be responsible in the face of grave danger while providing reassurances that the federal government will be with them for the recovery. For Trump, it also offers a chance to seize the spotlight himself. Over his 20 months in office, Trump has stirred controversy with his bombastic descriptions of hurricanes and other storms. And while his hyperbolic statements may have helped Americans heed warnings to evacuate, Trump has also drawn criticism for later belittling the damage some storms have afflicted on impacted areas. Below are some of Trump’s most outrageous statements on the hurricanes that have hit the U.S. during his watch. Trump was heavily criticized last year for downplaying the damage Hurricane Maria afflicted on Puerto Rico, telling the island’s residents shortly after the storm that compared to Hurricane Katrina, the death count from Maria was minimal. Later investigations found the death total from Hurricane Maria to be up to 3,000. After Hurricane Harvey struck East Texas, Trump lauded the Coast Guard for saving thousands of Texans from the flood waters. Trump insinuated many people in the water were out watching the hurricane. The comment was quickly rebuked by Texas officials including Harris County Flood Control District meteorologist Jeff Lindner who tweeted that many of those people were actually saving their neighbors from their flooded homes. Trump used a meeting with Coast Guard members to take a jab at the media while visiting an Air Force base in Houston following Hurricane Harvey. During his visit to Texas, Trump said the state would likely recover far faster than expected because “this is Texas.” He added: “I think for a lot of places maybe it never gets done.” After Hurricane Maria, swaths of Puerto Rico went without power for several months, which Trump blamed on the island’s poor infrastructure. 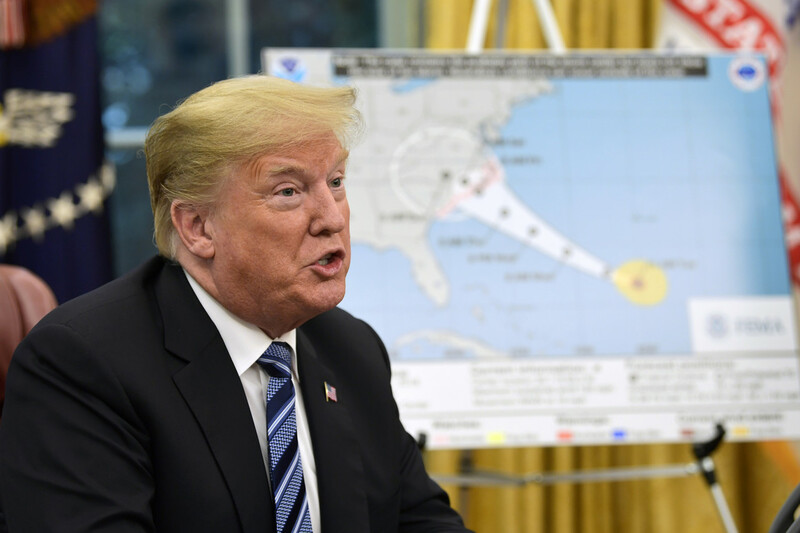 In a video tweeted Wednesday morning, Trump continued to assert his administration’s proactivity over preparations for Florence and warned residents of Virginia, North Carolina and South Carolina to evacuate areas in the storm’s path. He repeatedly asserted on Twitter and during press briefings that his administration is as “ready as anyone has ever been” for the coming storm, and even canceled two campaign events to focus his attention on hurricane response. Praising his administration’s efforts after Hurricane Maria, Trump said his response in Puerto Rico was an “incredible, unsung success” on Tuesday, prompting a verbal tussle with Puerto Rican officials and mainland Democrats. Though Trump claimed Puerto Rican Gov. Ricardo Rosselló would speak positively of the administration’s hurricane response, the governor shortly after released a statement revealing recovery efforts are far from completed. One of the most iconic images of Trump’s response to Hurricane Maria showed him chucking paper towels at hurricane survivors in a Puerto Rico church. The room sounded like a campaign rally, as Trump shook hands with cheering residents and handed off provisions like batteries and canned chicken. “Great people,” he said at the time.